Today we have these new fangled things called digital cameras. Amazing things really, taking away all that need for buying films and then sending them off to Truprint and waiting several weeks to get them developed, only to have pictures of somebodies skiing holiday come back. 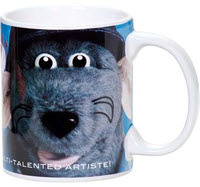 Nah, we can print the pictures ourselves now, or take the memory card to the Tesco print shop! 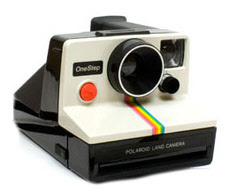 All you had to do was point the camera at your designated target, press the button, and out the front of the camera popped a little square piece of paper. Initially it just looked like a greyish brownish rectangle with a white surround, but then some kind of witchcraft kicked in and slowly an image started to form out of the murk. 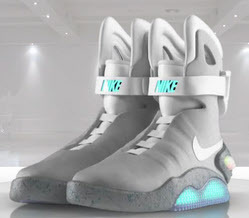 However you won’t have to wait that long if you want a pair of the rather cool Nike MAG trainers that Marty McFly wore in the aforementioned film, assuming you have a spare $2,000 (minimum) lying around that is. Nike have made a limited edition run of 1200 pairs of the shoes, and although they may not be self lacing like the ones in the film, they do look identical, and even have light up soles and illuminated Nike logo across the front. But the best thing about all this is that it’s Nike’s way of raising some money for charity, hence the steep asking price. Nike are giving the proceeds to the Michael J. Fox Foundation for Parkinson’s Research, which couldn’t be a more apt cause given that Fox is himself a sufferer of the disease. They are being offered for sale on eBay, with 150 pairs being made available every day. You’ll need to be quick though, as this all started a few days ago, and there are now just 600 left! Head over to the Back 4 The Future website for more details or to nikemag.ebay.com if you want to bid on a pair. Technically more of a Seventies item I suppose, the Hostess Trolley is one of those strange household items that you just don’t really seem to see any more, despite the fact that I’m sure they must still be available. Ah yes! Here we are, there’s an example of a modern Hostess Trolley on the Argos website, although it’s made from wood and looks a great deal more sturdy, and dare I say it, tasteful than the old metal versions that I’m thinking of. 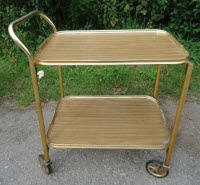 The retro Hostess Trolley was basically little more than a couple of trays on wheels. The idea was to make it easy for the “hostess” to bring food and drink through from the kitchen to the dining room table, thus enabling them to spend less time travelling backwards and forwards to the kitchen and more time with their guests. I distinctly remember my Nan having one very similar to the one in the picture accompanying this post. I think it was given to her as a present by my parents and several of my aunts and uncles clubbing together to buy it. I remember always wanting to wheel it about as a kid, and being told I wasn’t allowed to, which was probably just as well as my other overriding memory of it was that it was a bit wobbly and rickety – not exactly what you want for transporting drinks and hot food around. There are an awful lot of TV ads that have been ridiculed over the years but one that has probably been ridiculed more than most is the advert for Vidal Sassoon Wash & Go shampoo. Wash & Go was launched during the Eighties and was aimed at those Yuppie types who lived such incredibly busy lives. After a busy day at work, they hit the gym before hitting the town, but of course they need to look their best. However, having to both wash and condition their hair just took too long. What were they to do? To the rescue came Vidal Sassoon, a man who could only ever have become a hairdresser with a name like that, with a bottle of Wash & Go, a cunning little green bottle containing a mixture of both shampoo and conditioner! Our Yuppie friends lives were saved! Today, most households with a home PC probably also have a printer that is capable of printing full colour near photo quality pictures, and we kind of take it for granted. Most will own an ink jet style printer that cost less than 100 pounds (probably less than 50 pounds) and we tend to take it for granted really. As recently as the 1980s though this would have almost have been deemed witchcraft! Back then printers cost as much, if not more, than the computer they were connected to, and you were often limited to a mere handful of printers that your home computer could actually connect to (it was no doubt made by the company that made your computer too). 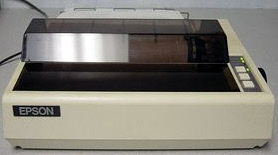 If you did have access to a printer back then, be it at home, work or school, chances are it was a dot matrix printer. These printers worked in a similar manner to a typewriter. Mounted on a rail inside the printer was the print head, which was a little device that had a row of pins that could each be pushed out individually. The pins were fired out at speed towards an inked ribbon which was just in front of the paper. The pins pushed the ribbon against the paper and thus left a dot on the paper. The pins retracted, the print head then moved a small distance along the rail, and a different selection of pins would fire out. By varying which pins were pushed forward, characters could be printed on the paper. I wrote recently about the BBC Domesday project being revamped and put up on the Internet for us all to enjoy 25 years or so on. To promote this a short video has been created featuring some clips from the launch of Domesday, from sources which I would imagine includes Tomorrow’s World, the old BBC technology programme. I certainly spotted Maggie Philbin (ex Mrs. Chegwin) and Howard Stableford, and I’m pretty sure there’s a lot of voice over from Paul Coia. The image above is a still from the video, showing one of the pages of text that (presumably) school kids had come up with. 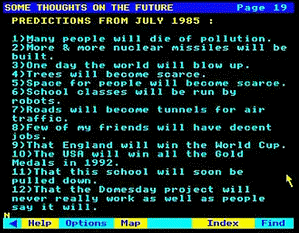 This one deals with predictions on the future from July 1985. I especially liked the last one, which at first I thought must have been added for the video, but a quick search on the new Domesday Reloaded site suggests otherwise.